Scotland is one of my favourite places in the world and I would like to introduce you to some of my top locations. This month the focus will be on the Treshnish group consisting of islands and rocky outcrops. More information on all Scottish islands can be found in the island bible “The Scottish Islands” by Hamish Haswell Smith. Just a few miles to the west of Mull, the archipelago of Treshnish lie in a turquoise sea that even tropical islands would find hard to beat (save the temperature). Now uninhabited, these islands are home to large seabird colonies and the month of May is the best time to visit with guillemots, fulmar razorbill, and of course the endearing puffin. Lunga is the easiest to land on and is the highest, providing magnificent views stretching over the sea to Rum in the North with Iona and Jura’s peaks in the South. Nestling under the hill amidst the braken lie the ruins of old “Black Houses” once home to Donald Campbell who, with his family left in 1824 – the group is now owned by National Trust Scotland. The evocative Bac Mor or Dutchmans Cap, the distinct shape formed by an ancient volcano cone, with the flat plain surround was created from glassy lava fields. I have sailed round Bac Mor a number of times but there seems to be no real safe place to land. Rocky shores strewn with kelp along with the constant surge of the sea coming in from the Atlantic makes scrambling ashore quite tricky. Perhaps this year the weather will be calm enough to allow some of us to scramble ashore and reach the top. Fladda is just like its name, a flat volcanic plateau where sea caves ring to the song of the seals who’s eerie mournful cry seems to belong here in this deserted and desolate place. The surrounding waters are teeming with puffins , thousands of them, fishing for sand eels in the clear waters. Puffin numbers are on the decline, either because of overfishing, or climate change, every year we notice fewer numbers. Close to the Mull shore, Cairn na Burgh More believed to be where the monks of Iona buried their library for safety during the reformation of1560 – this treasure has never been recovered, but should you find them, these wonderfully illustrated books would be worth millions. Up on the top of the island lie the remains of a medieval castle and a chapel. There is a story stating that Maclean of Lochbuie was imprisoned on the isle for feuding. For company he was accompanied by the ugliest woman on Mull, but this did not stop him giving forth a son who won back his title! It is also believed that the castle is where the Maclean clans unwanted wives were imprisoned. Lunga remains a favourite anchorage due to the tranquility of the place. The flora and fauna , chattering sea birds, vibrant colours of wild flowers, bluebells and pinks clinging to black cliffs on a warm May day, makes the island feel like a little bit of heaven. It is not all good news though, the ever present plastic pollution is rife and last year Owain and I struggled ashore at the far end of the island to collect the waste visible on the beach. 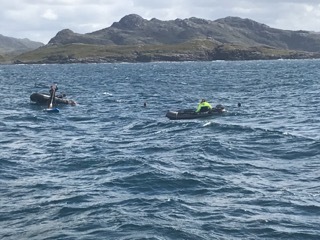 We found drinks cans from America and Canada, large swathes of fishing nets, fish boxes and fenders, the pair of us carried as much as we could but it was hard to get the dinghy close enough to the shore to gather the rest to take back to Oban. It is so daunting to see the amount of damage we humans have done and the size of the operation needed to make things right for nature once more. A quick round up on our last days in Scotland, and Autumn/Winter plans – stay tuned for another blog post detailing our seasonal highlights. Yesterday it rained all day, that typical Scottish rain they have a word for “Dreach” and just so wet that after a thrilling sail round Ardnamurchan, we gave up trying to do any more sailing and went below to read and eat cake. However, this morning is totally different and after a quick breakfast, it was an ideal opportunity to discover Rum. Some of us headed for the hills on the Croft 3 walk, up along the hill where the Rum ponies graze, out to the wilder landscape with fast flowing rivers and heather clad mountains. Others stayed around Kinloch, peering thorough the castle windows at the opulence and faded elegance of this Edwardian house. Leaving the anchorage bound for Muck, it was with a wistful heart to see the mountains of Skye and Rum, today, looming bright in the glittering sunshine for the last time this year. I am already longing to be back where the fulmars and shearwaters play. You will see that we are running a few October voyages, so may see some of you again. On our return I will be heading for the shipyard in Polruan to replace pipework, batteries and get a new mainsail made up along with countless other smaller jobs. On completion I will head for Charlestown or Padstow Christmas markets, so if you are around do come in for a coffee, it would be lovely to reminisce voyages with you. Many of you are asking about our recipes and where they come from, and this summer I have often made a cake that we ate in Denmark all the time. Made by Karen Thomsen, her Drommekage would be devoured by hungry sailors in minutes. So here is the recipe ideal after an autumnal walk. Happy baking! Over the last few years the success and popularity of my little ketch, Bessie Ellen, has grown at a fantastic rate, and a number of other vessel owners have approached me requesting assistance with their own marketing. It became apparent that in order to continue to manage Bessie Ellen, as well as other vessels, I would have to work with my marketing company to come up with a solution that was not only best for myself and my own customers, but for other ships too. The solution that allows us to move forward has turned out to be a new agency, and so VentureSail Holidays was launched at the beginning of this year. VentureSail is a partnership directed by myself, Nikki, along with Jo Downie & Phil Gendall, who are both from strong marketing backgrounds and based in Cornwall. We will be working together, allowing us to create an agency that will offer you great service, fantastic ships, and an exciting range of amazing destinations. The benefit to our customers will manifest itself with a prompter response, a seamless booking process and more back office support. (I am often at sea and don’t always get a phone signal). If you have a question or query, there will be a customer service team in our office in Cornwall to help you out. You can still find all our voyage information as usual, as Bessie Ellen will still maintain her own website, newsletters and social media, but with the admin connected to VentureSail Holidays. VentureSail will also have its own website with my voyages on, as well several other ships and their trips too. There is no added cost in booking through VentureSail – but a lot more support around your booking. I do, of course, understand the importance of “the personal touch”, and in this respect I would like to make it clear that I am still always available to take calls and receive emails directly if you prefer. If you’d like to learn more about VentureSail, and have first access to all offers, new ships and new voyages, make sure you sign up to the newsletter, which you can do by clicking here. So from Phil, Jo and myself, we would like to welcome you all aboard our new adventure. Have a nose around at www.venturesailholidays.com and we wish you many happy holidays at sea with us! It’s the end of the winter season, and our ship Bessie Ellen is preparing to get underway back to her home waters of Cornwall. There is excitement for the ocean passage ahead, route plans are being addressed – will it be North to Madeira, or Northeastwards to Lanzarote to avoid the worst of the Portuguese trades? Right now, the crew are high up in the rigging, tensioning, tarring, and overhauling all the gear, checking for weaknesses – we know all too well that things always go wrong at night and in the worst weather! This time of year can be tricky too, avoiding the spring gales that sweep across the Atlantic, but the ship is well found and the route will keep us inshore, giving the possibility to shelter from the gales along the Spanish & Portuguese coasts. Working a ship 24 hours a day can be tough, and although the watches are relatively short, either 4 or 6 hours, it is incredible how tired you can get. As the weather becomes colder after the heat of the Canaries, paired with constant moving of the ship, sleep is easy and deep. The further we travel homewards, the galley becomes a favourite hangout, helping bake the daily bread or giving the cooks a hand prepping the meals. For the deck watch, time passes looking after the continuous chaffing of gear, working aloft to protect spars and rigging, regular rounds and checks, along with updating forecasts and routes. Coffee is important, and the pots are always full of a steaming brew. Moments of beauty as the sun goes down below the horizon, moonlight on water and stars above, the evocative rolling of the waves as they lift our world onwards. Perhaps this life belongs in another time, little communication with the outside world – no phones or Instagram here. Embrace it, and maybe this is your opportunity to enjoy a potentially life-changing experience, whilst gaining an insight to life on the blue ocean. Perspectives change, and you become aware of more important issues; friendships, adventure and challenges while experiencing a glimpse of the past. So should you feel the pull of the waves, the desire to slip away to sea, then come and join Bessie Ellen as she travels from Tenerife to Cascais. 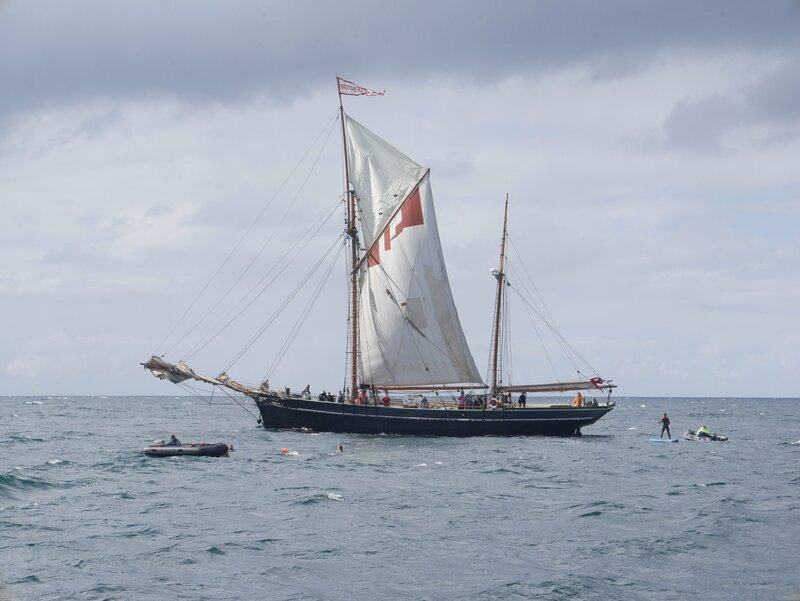 If you are between 18 and 25 and would like to apply for a berth then please contact us at nikki@bessie-ellen.com and be ready to sail from San Miguel Marina in Tenerife on Saturday 3rd March and finishing on Wednesday 14 March. The voyage cost is £400 (meals inc.), and flights and insurance should be purchased separately by the applicant (insurance is a must!). Fliss joined us in the summer of 2017, and has written a summary of her time on board Bessie Ellen. Take a look and discover what could be in store if you choose to join one of our Scotland voyages. “As I walked from Oban train station to Bessie Ellen, I couldn’t help but feel excited, and maybe a little nervous too. I didn’t know what to expect. Nikki welcomed me aboard, helping me down the ladder and introduced me to the crew, before leading me down below to find some of the other guests tucking into homemade fruitcake and gallons of tea and fresh coffee. After some quick introductions and scoffing of fruitcake, I chose a bunk. They’re built into the hull and surround the communal dining area, and are much more homely and comfortable than I was expecting! When all the guests had arrived, and we’d had a tour and a safety talk, we quickly uncoupled from the dock, ready to begin our adventure. One of the most cracking things about Scotland in the summer are the long evenings. We sailed off shortly after 4pm to reach a small cove on Mull by nightfall. That night, in the evening sun, we barbecued. I couldn’t believe my eyes when plates upon plates of seafood – squid, scallops, langoustine, homemade bread, garlic aioli – began to appear up on deck, and this was just the starter! We barbecued the seafood, buffet style, as Bessie Ellen trotted along at a steady pace. Putting away the sails was a job for everyone and we made everything ship-shape before heading down below for dinner which Pete, the chef, had been preparing all afternoon. Osso Bucco, I discovered, is a dish with beautifully tender hunks of beef in a rich tomato-based stew. I didn’t know what I expected from the food, but this certainly surpassed any expectations I had. The crew took care of all the washing up, so we could sit back and relax, whiling away the evening with wine and good chat, getting to know each other a little more. Some were couples, a few were single travellers like me, and many were just pairs of friends seeking a unique adventure together. We bedded down for the night at a decent time, satisfied and excited for the week ahead. Nikki was keen to get going the next morning to make the most of the day, so we all piled up on deck and got to work setting the sails after a hearty breakfast. The big breakfast was a necessity: everything is done by hand on the Bessie Ellen and the ropes are very heavy, taking at least 3 people on each rope to pull up each sail. It all looked so complicated, but the crew were fantastic at showing us what to do and very patient too. It was a bracing start to the morning in the chilly island air, but we were soon underway, sun starting to beam down as we trimmed the sails. We sailed up the Sound of Mull at a steady pace – Scotland really is something else. I got to try my hand on the helm, and the feel of controlling this magnificent tall ship made me fall in love with Bessie Ellen all over again. Around midday, after some more tea and a slice of lemon cake (made that morning), we were joined by a pod of inquisitive dolphins, playing in the bow-waves for a good forty minutes before heading off again. This was a wonderful experience and the first of several wildlife encounters over the week, which included puffins, sea eagles and porpoises. Lunch consisted of alfresco dining style up on deck; homemade focaccia, an enormous cheeseboard, charcuterie board, beautiful salads, olives, smoked salmon. My mouth is watering just remembering everything. Nikki and Pete truly make the most of having fresh fish readily available; over the week we were treated to haddock kedgeree, langoustines, and salmon. One evening we put the fishing lines over the side at anchor and had a feast of mackerel baked with butter and rosehips. There were a couple of vegetarians on board, and I was often amazed at the beautiful food presented for them too – Nikki and Pete make a point of catering for the guests’ every dietary requirement, so there’s little need to worry about going hungry. I’d forgotten what it was like to be truly calm – but not in a ‘splurged out out next to the pool’ kind of way. This was a different calm; a more mindful calm. Our days were comprised of optional tasks like setting the sails, scrubbing the decks and helming, mixed in with visiting castles, exploring little islands, and swimming off white sandy beaches. Each day held such rewards, and life outside of Bessie Ellen seemed irrelevant. Feeling her race along the white-topped waves at 7 knots, heeling at thirty-five degrees, doing what she was designed to all those years ago is as peaceful as it is exhilarating.